Journalist and Salon writer Rebecca Traister investigates the 2008 presidential election and its impact on American politics, women and cultural feminism. Examining the role of women in the campaign, from Clinton and Palin to Tina Fey and young voters, Traister confronts the tough questions of what it means to be a woman in today’s America. The 2008 campaign for the presidency reopened some of the most fraught American conversations—about gender, race and generational difference, about sexism on the left and feminism on the right—difficult discussions that had been left unfinished but that are crucial to further perfecting our union. Though the election didn’t give us our first woman president or vice president, the exhilarating campaign was nonetheless transformative for American women and for the nation. In Big Girls Don’t Cry, her electrifying, incisive and highly entertaining first book, Traister tells a terrific story and makes sense of a moment in American history that changed the country’s narrative in ways that no one anticipated. Throughout the book, Traister weaves in her own experience as a thirtysomething feminist sorting through all the events and media coverage—vacillating between Hillary Clinton and Barack Obama and questioning her own view of feminism, the women’s movement, race and the different generational perspectives of women working toward political parity. 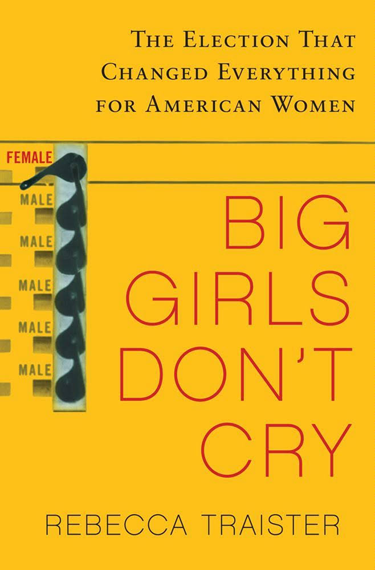 Electrifying, incisive and highly entertaining, Big Girls Don’t Cry offers an enduring portrait of dramatic cultural and political shifts brought about by this most historic of American contests.